Just in time for summer, we learn that the latest airline to join TSA’s pre-check program is British Airways, bringing to 53 the number of airlines participating in the program. The new work is called ‘Ando Volando’ (I’m Flying) and is by Miami-based artist Emilio Adán Martínez. Look for it in the Concourse E satellite. The new kite-like artwork has a companion display, ‘Andan Volando’ (They are flying), located inside Concourse D.
Both installations are constructed with paper, string and Australian pine branches and are meant to resemble kites and boats and suggest the idea of flight. Want TSA PreCheck? Go buy some paper. Summer is coming and checkpoint security lines at airports around the country are going to get longer. So if you haven’t signed up for TSA’s PreCheck program yet, now would be a good time. Don’t want to take an extra trip to the airport to do that? You may not have to if you’ve got a Staples office supply story nearby. 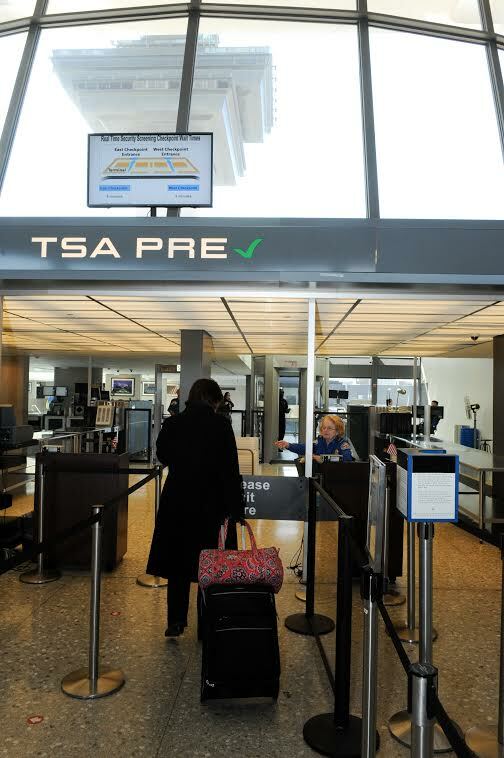 Staples office supply company and Idemia, the company that has the TSA contract to enroll people in the PreCheck program, have teamed up to set up IdentoGO enrollment centers in 50 Staples stores. The cost of enrollment in the TSA PreCheck program is $85 and is good for five years at $17 per year. Need to get new passport photo or a certified birth certificate? Those IdentoGO Centers at Staples will help with those too. And if Staples isn’t in your community, check this site for another place to sign-up for TSA PreCheck. Football fans fumbling over where to sign-up for the Transportation Security Administration’s security checkpoint shortcut program – called TSA PreCheck – can now take care of that task during NY Jets and San Francisco 49ers home games at MetLife Stadium in New Jersey and Levi’s Stadium in Santa Clara, California, respectively. The NY Jets and the San Francisco 49ers are the first to partner with identity-verification company Idemia to bring the IdentoGO technology and the PreCheck verification program to sports stadiums. In the next few weeks, more sports teams are expected to join the program, which also provides some biometric-based technology that can enable ‘trusted fan’ programs to be deployed at some stadiums. 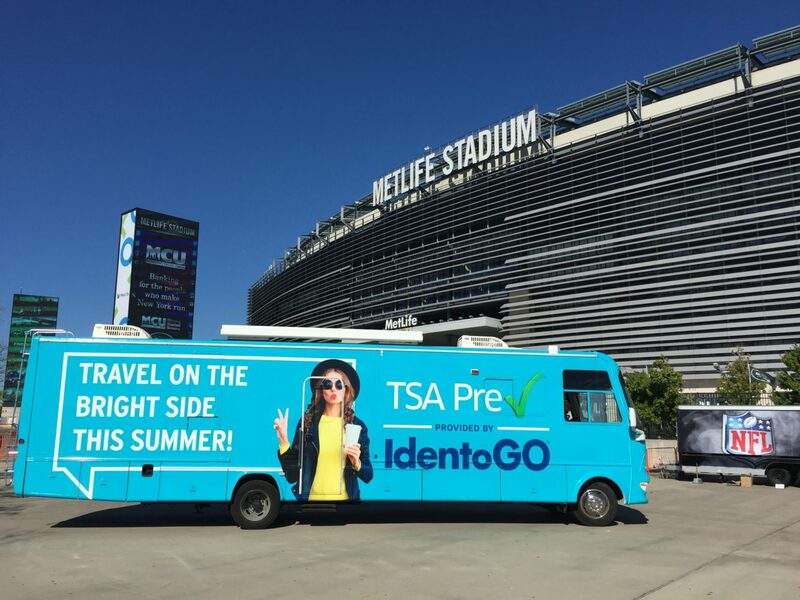 For now, Jets fans (ticketed or just tailgating) seeking to enroll in PreCheck will find a branded IdentoGo recreational vehicle parked at the MetLife entrance (between parking Lots E and F) on game days. San Francisco 49ers fans on the west coast will need to be ticketed for the day’s home game to access the IdentoGoRV, which will be parked along the vendor-rich “Faithful Mile” (at the Green Parking Lot 1- Gate C). But signing up at these football stadiums will come with a small bonus. In addition to the time-savings for sports fans, those who sign up at New York Jets home games will receive a $20 gift certificate that can be used inside the stadium towards beer, food and merchandise. Fans who sign up at either stadium will also get an approved clear plastic bag that can be used to take items in the stadium. The San Francisco 49ers PreCheck sign-up program kicked this past this weekend, but response to the program at NY Jets home games has been so positive that IdentoGo had to scramble to double on-site enrollment capacity after the first game. Who gets your $85 and can you skip that fee? The vendor – IdentoGo is currently the exclusive provider of TSA PreCheck – gets $34.50, which TSA says, is used for staffing, leases, infrastructure, web, network, materials, equipment, mobile events, call centers and other services for the all the application sites around the country. Later this year or next, TSA says it plans to issue a request for proposals from other companies that want to bid to provide this service. $12.50 is the FBI’s Fee. The balance of the fee goes to TSA, which uses its portion for administration of the application program. For those who would like to avoid paying the fee, there are about a dozen credit cards (including selected brands of American Express, MasterCard, Visa and Diners Club) that offer a fee credit for the TSA PreCheck (and Global Entry) program and several airlines and hotel brands, including United Airlines, Hilton, IHG, Marriott and Carlson Rezidor, that allow members to pay for the program with mile or points.